While Pittsburgh’s hourly job market continues to hold up relatively well compared to most others around the country, Pittsburgh area career schools are finding student enrollment struggling to keep up with year ago levels. Not because of a bad local economy. This is because when an area’s job market is doing well, fewer people seek re-training. It is this re-training market that two year schools gain a large percentage of their revenue from. We saw this phenomenon in Florida and the west coast markets back in 2005 and 2006 when the job markets in those areas were booming from the then white hot housing markets. Pittsburgh was still recovering from the huge loss of US Air jobs and a number of large retail chains that closed. Now it appears the pendulum has swung the other way. With Monster.com proclaiming Pittsburgh the hottest job market for the 5th month in a row in July based on their Online Jobs Index in year over year activity (“On an annual basis, Pittsburgh is the only metro market now showing greater online job availability compared to a year ago and remains the Index’s top growth market year-over-year due to continued strong demand for healthcare, IT, education, construction and production occupations”) and as we see our help wanted ad volume hold up well to last year, local Pittsburgh area jobs, led by healthcare and education, though not enjoying large increases year over year, are increasing none the less. For schools in better job markets to maintain growth it is highly recognized they must be willing to make adjustments to their course offerings to offer training in the areas of particular strength in that market. We are beginning to see that in Pittsburgh with new courses being offered in Hospitality Management (for the new casino) and in healthcare fields such as Occupational and Physical Therapy Assistants. As we have predicted in the past Pittsburgh, though certainly not unaffected by the national economy, is continuing to weather the storm relatively well. The next big job fair in Pittsburgh will be held July 23rd at Mellon Arena. No pre-registration is required. The doors will be open from 10:30AM to 3:00PM. We expect about 30 companies and schools to be in attendance. This event will be in the West Igloo Club Lounge. Job Seekers will enter through Gate 3 (directly in front of the arena). HCR Manorcare, Goodwill , Burns & Scalo Roofing and more. Access is easy by either public transportation or parking in one of the Arena lots (parking will range from $5.95 to $7.00 depending on which lot is used). It is strongly suggested you bring plenty of résumés. Proper attire is required (remember, you are trying to make a good first impression!). Admission is FREE for all job seekers and there is no pre-registration required. Just come on in, meet with company or school representatives, smile, shake hands, ask questions and make a good impression! This Diversity Job Fair is in partnership with the Urban League of Greater Pittsburgh, Pittsburgh’s CW Television, The Allegheny County Department of Veteran Affairs and AARP Work Search. All companies in attendance are proactively pursuing a diverse workforce. 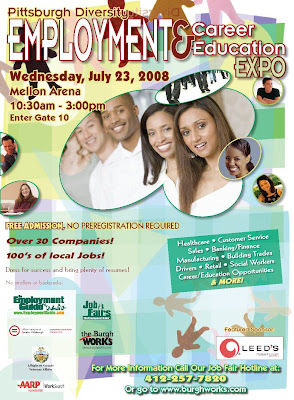 Our partner organizations will be on hand to help you with the employment services they offer.